Rose Ramona "Mona" Muntz, 89, of David City, died Friday, February 2, 2018, at St. Joseph's Villa in David City. Funeral Service Wednesday, February 7, 2018 2:00 P.M.
Visitation Tuesday 5-7 P.M. Wednesday 1-2:00 P.M.
Rose Ramona Muntz was born June 20, 1928, in David City, to John F. "Jack" and Rose (Koskan) Knott. She attended school in David City and graduated from David City High School in 1946. On August 27, 1948, she married Merlyn Muntz at St. Mary's Catholic Church in David City. Mona was a lifelong resident of David City and was very active at the Senior Center, had worked in Hospital Administration Butler County Hospital for many years and also worked for David City Manufacturing. She was in the VFW Auxiliary for 66 years and served as President from 1960-1961. Mona was most proud that her three brothers were pilots and her three sons and husband were all veterans. 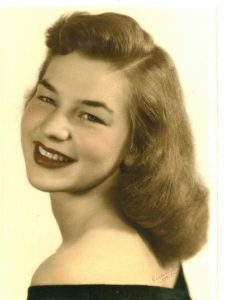 She is survived by her three sons; John Carl Muntz of Columbia, Missouri, Ronald Wayne (Sharon) Muntz of San Antonio, Texas and Steven Merle (JoEllen) Muntz, Chadds Ford Pennsylvania, and grandchildren; Brian, Jessica, Emily, Juliann, Jacob, Matthew and seven great-grandchildren;Zaria, Dezhion, Ayden,Lorenzo,Jr., Hendrix, Callie and Cassidy. She was preceded in death by parents, husband Merly and brothers George, John and Kenneth Knott.